The NYTimes ran an article yesterday about Harvard Law Library working to digitize a vast trove of cases. In what some librarians may see as a controversial move, the Harvard librarians are slicing off the spines of all but the rarest volumes and feeding some 40 million pages through a high-speed scanner. They are taking this once unthinkable step to create a complete, searchable database of American case law that will be offered free on the Internet, allowing instant retrieval of vital records that usually must be paid for. The Atlantic ran an article recently that is near and dear to the heart of Scribes --The American Society of Legal Writers' mission (disclosure: I am executive director of the organization). The article works to promote plain language. As noted, the problem of needlessly complex writing—sometimes referred to as an “opaque writing style”—has been explored in fields ranging from law to science. Yet in academia, unwieldy writing has become something of a protected tradition. Library As "Clinic Of The Soul"
The NYTimes ran an interesting piece over the weekend discussing the reinvention of libraries. [T]he principal danger facing libraries comes ... from ill-considered changes that may cause libraries to lose their defining triple role: as preservers of the memory of our society, as providers of the accounts of our experience and the tools to navigate them — and as symbols of our identity. In the United States, while the number of libraries that have disappeared is not remarkably high, public libraries have seen their budgets cut, their stocks culled, their staffs reduced and their opening hours shortened. The backdrop of this story takes place in a beautiful library that invokes the idealized view of libraries that most librarians hold dear. From the director: The story told in The Library initially came from wanting to explore the relationship between memory and place. I have strong recollections of my neighbourhood library in Houston, Texas in the US. I can recall the layout, where certain sections of books were, the smells, and the sounds. Many outlets, including The Chronicle of Higher Ed, note that Google Books recently received another big win in favor of fair use. The U.S. Court of Appeals for the Second Circuit handed Google another victory on Friday in a high-profile case about copyright infringement, declaring that its scanning of books as part of the Google Books project constitutes fair use. In its ruling, a unanimous three-judge panel of the court upheld a federal judge’s 2013 ruling against the Authors Guild, which sued the tech giant in 2005. As The Atlantic notes, "the Google Books case had seemed to drag on forever: The Authors Guild first filed suit 10 years ago. But the theory behind the eventual ruling was a quarter-century in the making." 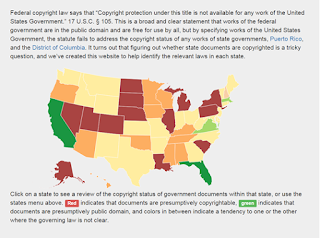 Harvard Library has created an interactive map of the copyright policies in all 50 states. The map is color coded for openness. Federal copyright law says that “Copyright protection under this title is not available for any work of the United States Government.” 17 U.S.C. § 105. This is a broad and clear statement that works of the federal government are in the public domain and are free for use by all, but by specifying works of the United States Government, the statute fails to address the copyright status of any works of state governments, Puerto Rico, and the District of Columbia. It turns out that figuring out whether state documents are copyrighted is a tricky question, and we’ve created this website to help identify the relevant laws in each state. A post over at Vitae, a Chronicle of Higher Education blog, gives pointers to academic writers on getting a useful critique. In anticipation of the first draft conferences with my international LL.M. students, I couldn't help but wish that they knew this information. The writing coach noted that the writer should reflect on what he or she really wants to know about specific aspects of the piece. In short, the first step to getting helpful feedback is to define your reader’s job. For example, are you wondering how you might expand the discussion section of your draft? Are you uncertain whether its current organization logically supports your thesis? Are you thinking you need more context to set up your argument? Do you suspect a certain point needs further explication? There is an interesting thread running on the AALL My Communities email list regarding West Library Maintenance Agreements (LMA). This posting appears to have hit a raw nerve in the US law librarian community. I received approximately seventeen responses from law firm, court/government, and academic law librarians. Out of the seventeen, two law libraries have already left their LMA contracts. But, many of you have contemplated doing so. Several of you mentioned that they decided not to cancel their LMA because they received as much as a fifty percent discount on their contract, or they did not cancel because they were concerned about the extra paperwork and hassle of reconciling invoices and monthly statements if they did NOT keep their LMA intact. With the recent retirement of James Billington as the Librarian of Congress, the United States is set to get its first new Librarian in nearly three decades. The current librarian, James Billington, has held the title since his appointment by President Reagan in 1987. Though named by the president and confirmed by the Senate, the Librarian doesn’t change with every new White House. After being appointed, Librarians are free to serve as long as they want—that’s why there have been only 13 of them since 1802. In other words, this will be the first time a new Librarian has been appointed since the invention of the web. 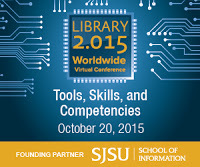 The fifth annual Library 2.015 Worldwide Virtual Conference will be held on October 20th, 2015 from 7am - 8pm US Pacific / 10am - 11pm US Eastern. The School of Information at San José State University is the founding conference sponsor. Register as a member of the Library 2.0 network to be kept informed of future events! In May 2014, the NYTimes wrote about the Supreme Court continuing to edit opinions after release. Earlier this week, a NYTimes article noted that SCOTUS is now disclosing after-the-fact changes to its opinions. Check out my latest post on the RIPS Law Librarian Blog discussing issues surrounding e-book collections in law libraries.